Acid toning has to have been one of the most revolutionising things to boggle my mind in skincare after I got interested in it. The idea of applying an acid directly to my skin just seemed so weird, frightening and confusing at first. After my initial tentativeness however, I fully embraced it. I feel slightly wrong if I haven't applied an acid to my face at least once a day. I've written about my love for the Pixi Glow Tonic, and I'm sure everyone has heard of the P50 (pictured) and the Clarins Gentle Exfoliator Brightening Toner (I keep small samples of this for travel). 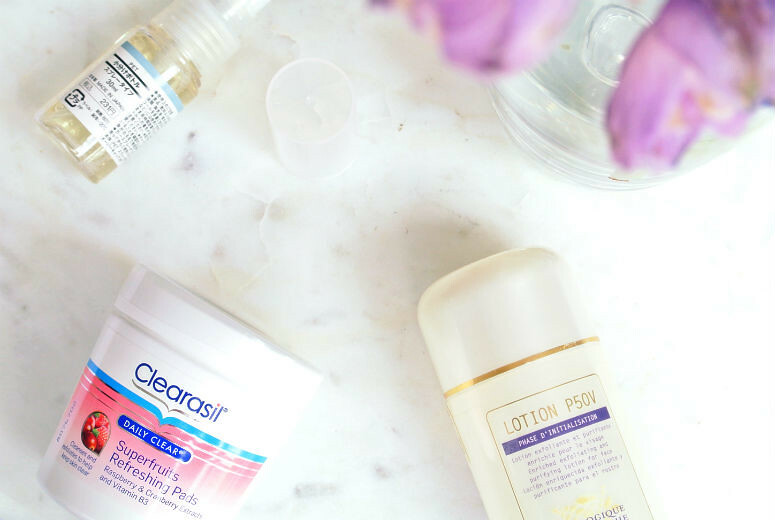 However, today I wanted to talk about what you can find on the high street that ticks the exfoliating box without breaking the bank. Step forward the Clearasil Daily Clear Superfruits Refreshing Pads. I know, Clearasil, right? Seems like an odd choice, because you would normally associate this as the teenage acne brand. The thing is, sometimes we need a little help with acne. I know I certainly do. These pads come with 1% Salicylic Acid which will aim to deal with any spots that you have. It will also help with the turnover of dead skin cells on the surface, which will help keep spots away. There's also citric acid as a fruit acid, and raspberry and cranberry fruit extract for antioxidant purposes to top it off. A perfect acid combo really. What I do like about these is the medium. I love the fact that these are single use pads with a particular raised/dipped texture that encourages exfoliation. If I have one complaint, it's the smell. I think a lot of people might find the berry scent quite nice compared to other Clearasil products, but I have very sensitive eyes, and can feel the acid smell on my eyes if that makes sense (in a totally non-lethal way of course!) which makes my eyes water a little. Price-wise and product pay off though, I don't think you can ask for more. These are great for combatting spots at the acid toning stage, and are great value for money. I'm not sure why, but Boots and everywhere else seems to be out of stock in store, but I've just seen that Amazon have then in stock for less than £5.